Tigers manager Brad Ausmus has words with umpire Angel Hernandez, who ejected Ausmus and Ian Kinsler for arguing balls and strikes Monday night. ARLINGTON, Texas (AP) — Detroit Tigers second baseman Ian Kinsler had harsh words Tuesday for Angel Hernandez, saying the veteran umpire should get a different job. “It has to do with changing the game. He’s changing the game. He needs to find another job, he really does,” Kinsler said. Kinsler’s comments were reported online by multiple media outlets just before Detroit played the Texas Rangers and early in the game. A normal rotation for the umpires would put Hernandez at second base for the series finale Wednesday, just steps away from Kinsler much of the night. Hernandez said he has no issues with Kinsler. “This is my 26th year in the big leagues, and anybody that knows me knows I’m a professional,” Hernandez said. Last month, Hernandez sued Major League Baseball alleging race discrimination. Kinsler said he has no personal problem with Hernandez, and that he’s not mad at him. “He just needs to go away,” the four-time All-Star said. In 2010, an ESPN survey revealed that 22 percent of players asked called Hernandez the worst umpire in the majors. Kinsler was ejected while batting in the fifth inning of Detroit’s 6-2 loss to the Rangers on Monday night. After taking the first pitch, which he thought was low, Kinsler questioned the call and said he told Hernandez it was only a strike because he called it a strike. When the next pitch was well outside and called a ball, Kinsler asked Hernandez, “What about that one?” and was ejected. Kinsler, holding his bat still, then stood face-to-face with Hernandez and had more words with him. 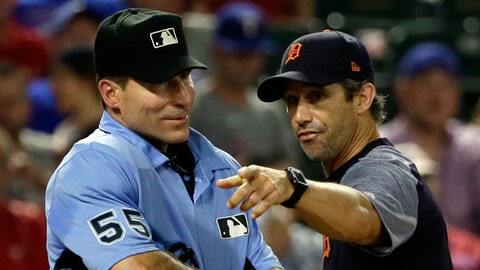 Tigers manager Brad Ausmus also got tossed when he came out to argue with the umpire. In a complaint filed in U.S. District Court in Cincinnati, the 55-year-old Hernandez, who was born in Cuba and lives in Florida, cited as evidence of alleged discrimination his lack of World Series assignments in the past decade and MLB not promoting him to crew chief. Hernandez worked the World Series in 2002 and 2005 but has not since. He worked last year’s NL Championship Series along with Division Series in 2011, `12 and `15.